Mauricio Mendez Cruz finishes the first section of Xterra Beaver Creek, transitioning from the swim to the mountain bike, on Saturday, July 21, at Nottingham Park in Avon. Cruz took first place in the race, knocking off five-time defending champion Josiah Middaugh. BEAVER CREEK — Mexico City’s Mauricio Mendez Cruz snapped local triathlete Josiah Middaugh’s streak of five consecutive wins at Xterra Beaver Creek on Saturday, July 21. After a 1-mile swim, 25 kilometers of mountain biking, Cruz caught Middaugh during the fourth mile of the 6.2-mile run to capture the win. Cruz finished in 2 hours, 7 minutes, 35 seconds, roughly a minute ahead of Middaugh (2:08.31). While second is nothing to sneeze at, all was not lost for the Middaugh family as Sullivan Middaugh, 14, won the men’s sprint triathlon, a shorter version of the pro course, for the second year in a row with younger brother, Porter Middaugh, in fourth place. Speaking of repeating, Scotland’s Lesley Paterson went back-to back in the women’s Xterra Beaver Creek. Cruz is no stranger to the podium at Beaver Creek. He finished second to Josiah Middaugh here last year. The key to this year’s race was that Josiah Middaugh wasn’t as dominant on the mountain bike as in years past, and did not have as much of a cushion as he would have liked going into the run, Cruz’s strength. 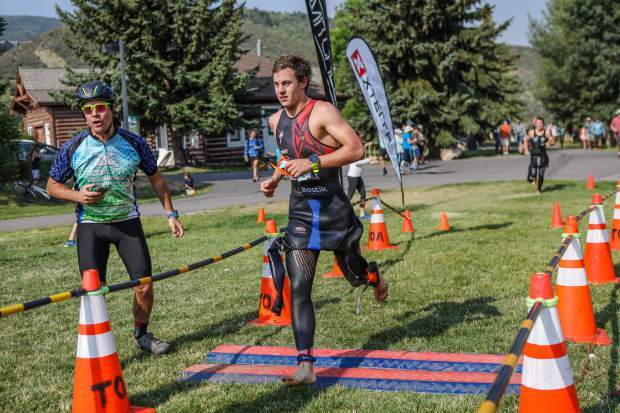 While Cruz and Josiah Middaugh have different schedules, their paths will cross again at Xterra Pan Am in Ogden, Utah, in September as well as at the Xterra World Championship in Hawaii. Josiah Middaugh won the latter in 2015, followed by Cruz in 2016. After two more Xterra races in August, one in Mexico and the other in Canada, Josiah Middaugh plans on regrouping for his traditional late-season push. Last year, Paterson, who was born in Stirling, Scotland, and lives in San Diego, came to Colorado 12 days in advance of Xterra Beaver Creek to adjust to the thin air. She had no such luxury this year, as she was winning the International Triathlon Union Cross World Championship in Denmark last weekend. Yet she still knows her way around the course, finishing in 2:34:21, finishing ahead of Boulder’s Tess Amer (2:35:12). After such a busy schedule, Paterson is due some down time, which includes chocolate and some movies. While there is no doubt that genetics help, let’s make this clear, Josiah Middaugh is not an Earl Woods-like father, intent on making his sons athletic prodigies. But young master Sullivan Middaugh won the Xterra sprint triathlon — 0.5 mile of swimming, 14.5 kilometers on the bike and 4.9 miles of running — for the second year in a row, while Porter, 12 was fourth among the 99 men entered in the race. Like most kids in the county, Sullivan Middaugh is active during the summer months. He’s on a swim team, runs with the Battle Mountain cross-country team during optional summer workouts as a freshman-to-be, and competes in the men’s sport division of the East West Destination Hospitality Mountain Bike Series every other Wednesday. And so, maybe it wasn’t too surprising that when he got to the end of the mountain-biking leg, he knew he had the lead. “I didn’t know I was ahead until the second transition because there were no bikes there,” he said. The 14-year-old said he took “a hard pace,” and broke the finish ribbon in 1:28:05.